One of the best ways to turn visitors into customers is to build trust with them. However, talking about how great your business and your services are often isn’t enough. In some cases, the best way to make visitors trust you is to let other customers do the talking for you. Testimonials and reviews are some of the most powerful tools at your disposal to build trust. In this article, we’re going to talk about why you should showcase your business reviews up and front, with a focus on Yelp. We’ll also introduce you to a plugin to help you add Yelp reviews to WordPress and teach you how to use it. When people are looking to buy new products or try new services, they tend to look online to find the best option. Setting up a website to promote your business is an excellent way to reach them, but just having an online presence might not be enough. Having a site can help people find you, but you also need to present your business in a good light to convince those visitors to become customers. There are a lot of ways you can use your website to build trust with prospective customers. For example, you can use product photos, showcase the services you provide, share contact information, and more. Those are the basics that almost any business website can benefit from. However, if you want to go the extra mile, you should also look into including client reviews and testimonials for your business. Testimonials are an excellent way to build trust with visitors to your website. They help validate your business and provides valuable information to prospective clients. People tend to trust recommendations from their peers more than sales pitches, so these can be a powerful tool. These days, there are a lot of platforms people can use to leave reviews for businesses online, such as Google and Yelp. We’re focusing on Yelp for this article because it’s one of the most popular online platforms for business reviews. Keep in mind – when it comes to business reviews, you shouldn’t just limit yourself to displaying five-star comments. You want to have as many excellent reviews as possible, but if all your testimonials are too glowing, it can make them look false. However, if your business does have an abundance of five-star reviews, then by all means, don’t be shy about showing them off. The Yelp Reviews Widget plugin enables you to pull data from Yelp and display it on WordPress using a widget. With this plugin, you can showcase the latest reviews for any Yelp business you want, including multiple locations. 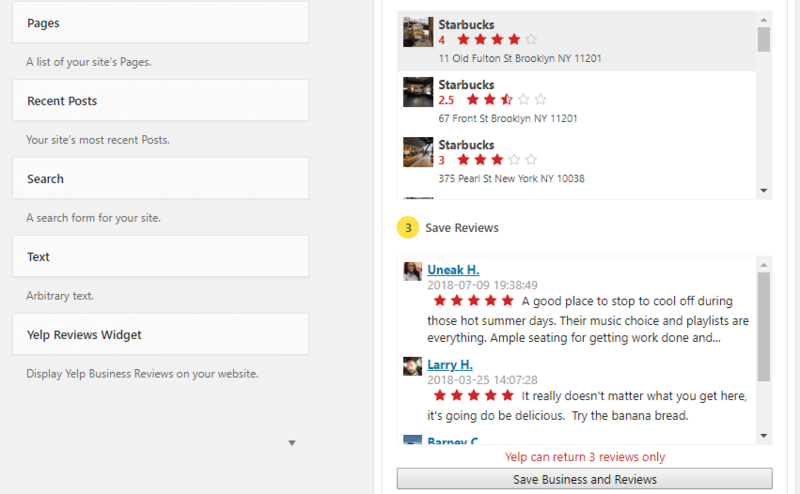 Out of the box, the plugin pulls the latest three reviews from whichever Yelp business you choose. The default style the plugin uses for the reviews is very clean, and it showcases their star ratings so that visitors can get a quick idea about your business’ quality. The way the plugin works, it needs a Yelp API key to pull the information it needs from the platform. It then stores your latest reviews within the WordPress database, so it doesn’t have to pull them from Yelp each time someone visits your site. it’s the only Yelp plugin with this feature, which can slightly increase loading times and also avoids issues in case Yelp is temporarily unavailable. Price: The standard plugin is free and the developers also offer a premium version, which starts at $45. We should also mention that there are other plugins that enable you to add Yelp reviews to WordPress. For example, the Yelp Widget Pro plugin shares a lot of functionality with our pick, so feel free to check out either plugin to see which one you prefer. We’re now going to put the Yelp Reviews Widget plugin to use. As such, go ahead and install then activate the plugin before proceeding. 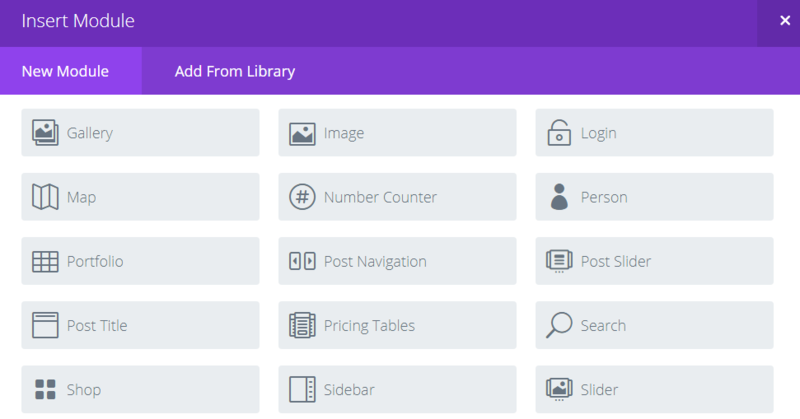 Keep this tab open for now and return to your WordPress dashboard. Next up, we’re going to connect the Yelp Reviews Widget plugin to the platform using this key. That’s it! Now all that’s left is to use the plugin’s widget to add reviews to your pages. You’ll also notice there are a few extra tabs that read Review Options, Display Options, and Advanced Options. These settings are only available for the pro version of the plugin, so skip these and save your finished widget. Save the changes to your page, and that’s it! This approach requires a couple of small extra steps. However, but it gives you full control over where to display your Yelp reviews. There are a lot of ways you can build trust with your website’s visitors. However, few methods are as effective as displaying reviews from past customers. In these cases, pulling review from a third-party platform such as Yelp tells visitors they’re the real deal. Get a Yelp API key. 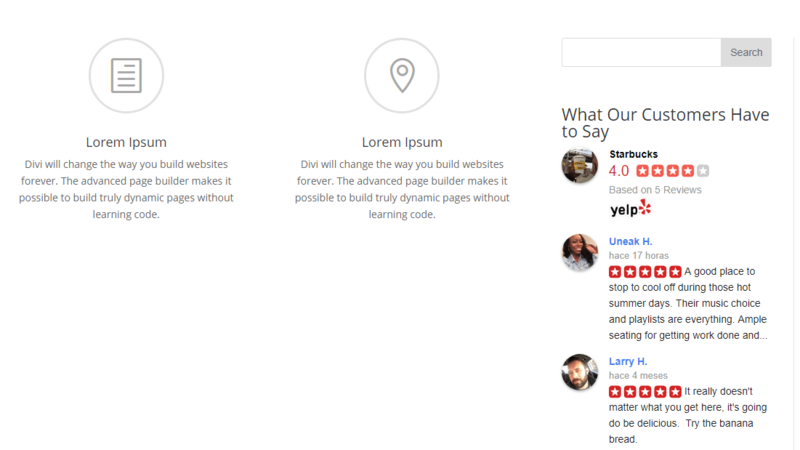 Add the Yelp Reviews widget to your pages. Do you have any questions about how to add Yelp reviews to WordPress? Let’s talk about them in the comments section below! The post How to Add Your Business’ Yelp Reviews to WordPress appeared first on Elegant Themes Blog.